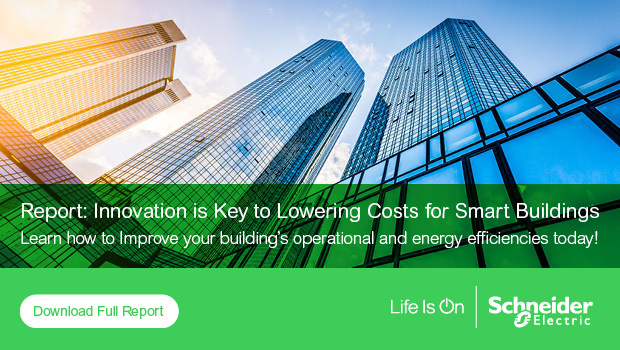 This is the fifth and last in a series of posts discussing the recent report from industry analyst Verdantix titled ‘Schneider Electric Innovates To Lower Cost Of Smart Buildings’. So far, we’ve looked at how trends in the Internet of Things (IoT), Cloud-based services, and energy storage are making buildings smarter, more efficient, and green, while helping cut operational costs. In this post, we’ll look at how the IoT, smart buildings, and smart infrastructure are forming the foundational blocks of tomorrow’s greener, cleaner, and healthier smart cities. Cities already consume 75% of global energy resources and account for 80% of emissions. And by 2050, 66% of the world’s population will live in cities. Cities are faced with these challenges, as well as high citizen expectations, severe budget constraints, and the need to attract jobs and investment. To become more efficient, sustainable, livable, and attractive, cities need to become smarter. Gartner defines a smart city as cooperation and information sharing across sectors and systems to achieve sustainable outcomes. The information comes from connected things. Today, 45 percent of these are in smart homes and smart commercial buildings. Gartner estimates that the total number of connected things will grow from 1.1 billion in 2015 to 9.7 billion in 2020. Commercial facilities, industrial plants, and homes are already beginning to leverage connected devices and the IoT to boost performance and sustainability. Industry analyst Navigant points out that this same level of innovation needs to extend throughout all of the infrastructures a city depends on. This includes government services, transportation, public safety, water, data and communication, and energy. Many cities are already beginning to create digital infrastructures that collect, manage, and analyze data from connected assets. Government agencies and wider groups of stakeholders are using this ‘digital hub’ to gain new operational insights, enable a more predictive approach and, in turn, improve the efficiency and quality of services. For example, Carson City, Nevada, is now using integrated, mobile-accessible management of water, wastewater, renewable energy plants, and traffic lights. This transformation has reduced man-hours and costs while increasing reliability and responsiveness. The previous post mentioned how many energy consumers are becoming ‘prosumers’ by setting up their own microgrids, adding renewable energy generation and storage. Utilities are hoping to access the flexibility of these distributed energy assets to help balance the grid and reduce the risk of blackouts. Fortunately, cloud-based solutions such as Distributed Energy Resource Management Systems from Schneider Electric are connecting energy providers and consumers together in a collaborative, win-win partnership. First, at the smart building or home level, an intelligent microgrid management system reliably coordinates onsite energy generation and storage assets. The facility team or homeowner is then given access to a utility-hosted demand management platform. Such platforms integrate real-time and historical energy and operation data from connected devices throughout the facility or home, as well as weather data inputs. The portal also acts as the communication channel with the energy provider, allowing participation in smart grid programs. The platform takes into account the energy needs of the enterprise or homeowner, then proposes the most advantageous response to different opportunities. This could include reducing load in response to a curtailment request or variable tariffs, performing peak demand management, maximizing self-consumption, or selling energy back to the grid. In this way, the local utility and the energy user are working together to optimize costs, reliability, and sustainability for buildings, homes, and the grid. Schneider Electric offers technology and services that are helping catalyze the urban transformation to smart cities. This includes helping city governments drive sustainability with performance visibility across all departments, services, and utilities to reduce energy, emissions, and water consumption. It also includes enabling utilities to improve the reliability of their infrastructure and to integrate more distributed generation. Schneider Electric also offers micro-grid control, energy storage, power management, and energy management solutions that are helping utilities, facilities, and homes to become more efficient, more sustainable, and perform better. For more information on the intersection of IoT and smart cities, refer to the Schneider Electric blog post ‘Why the Internet of Things will be at the heart of smart city transformation’, and the white paper ‘Smart Cities: Strategic Focus on Real-time Infrastructure Control Systems’. There is a movement happening now for sure, and it’s amazing what technology is helping us to accomplish. It’s great to see the current and upcoming shifts towards greener, cleaner living – especially in cities where it’s needed most. The Transition from Smart Buildings to Smart Cities How energy storage makes smart buildings leaner and greener Maintaining the smart cities building blocks Questions about Smart Cities? Then VERGE Cities 2.0 is the event for you!